Isis video 'shows leader still alive' Jump to media player The Islamist militant group Isis has released a video apparently showing its leader Abu Bakr al-Baghdadi - 24 hours after rumours he had been killed in an attack. Isis leader issues call to Muslims Jump to media player The leader of the Islamist extremist group Isis has called on his fighters to avenge wrongs committed against Muslims worldwide. Isis bulldozes into 'Islamic state' Jump to media player Jihadist militant group Isis has said it is establishing a caliphate, or Islamic state, on the territories it controls in Iraq and Syria. The Islamist militant group Isis has released a video apparently showing its leader Abu Bakr al-Baghdadi giving a sermon at a mosque in Mosul, northern Iraq. 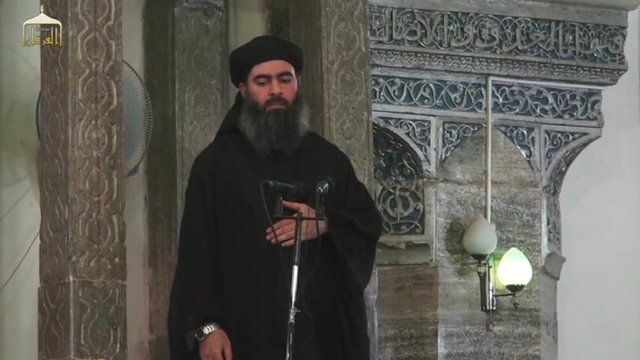 In his address to the congregation, Baghdadi preaches about the importance of Ramadan and jihad. It is thought to be the first video of the Islamist leader - and has surfaced some 24 hours after rumours he had been injured, or even killed in an attack. Baghdad correspondent Paul Adams explained why the man in the video was thought to be Baghdadi.